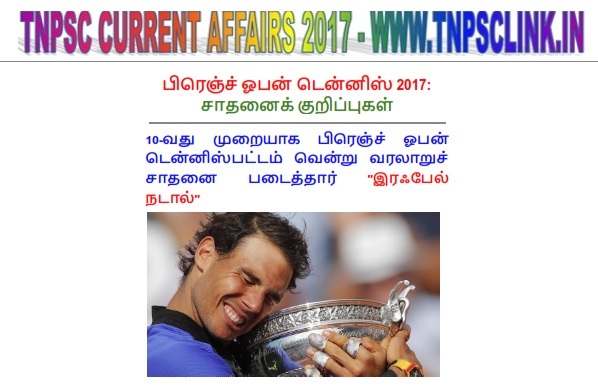 TNPSC Sports Affairs French Open Tennis 2017 in Tamil PDF Format, for forthcoming TNPSC, TRB, TET, TNPSC Group 2 Exams. Download this file to PDF format. The French Open, also called Roland-Garros, is a major tennis tournament held over two weeks between late May and early June at the Stade Roland-Garros in Paris, France. Named after the French aviator Roland Garros, it is the premier clay court tennis championship event in the world and the second of four annual Grand Slam tournaments, the other three being the Australian Open, Wimbledon and the US Open. Roland Garros is currently the only major held on clay, and it is the zenith of the spring clay court season.